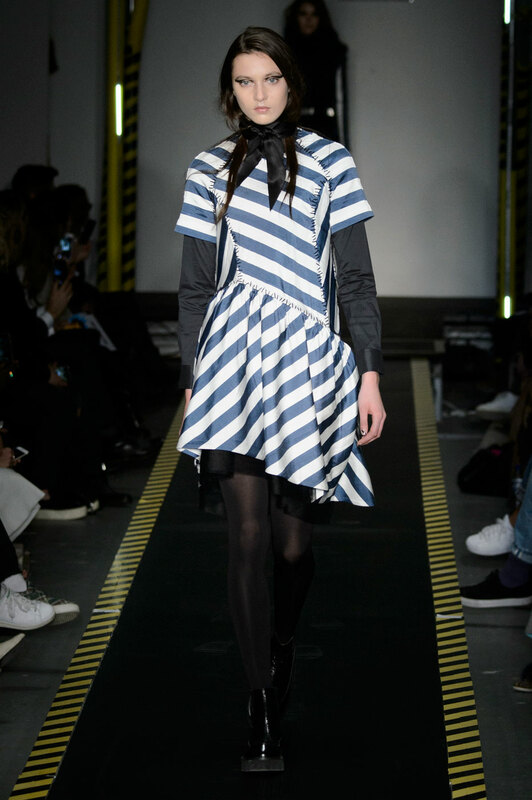 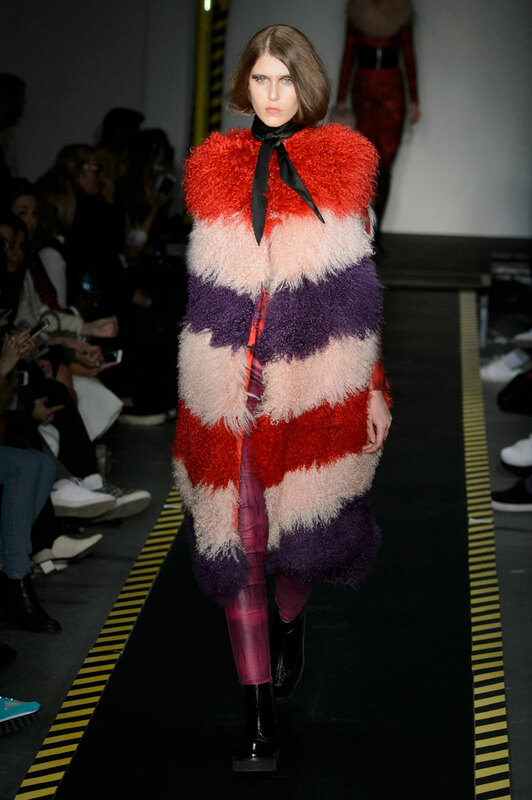 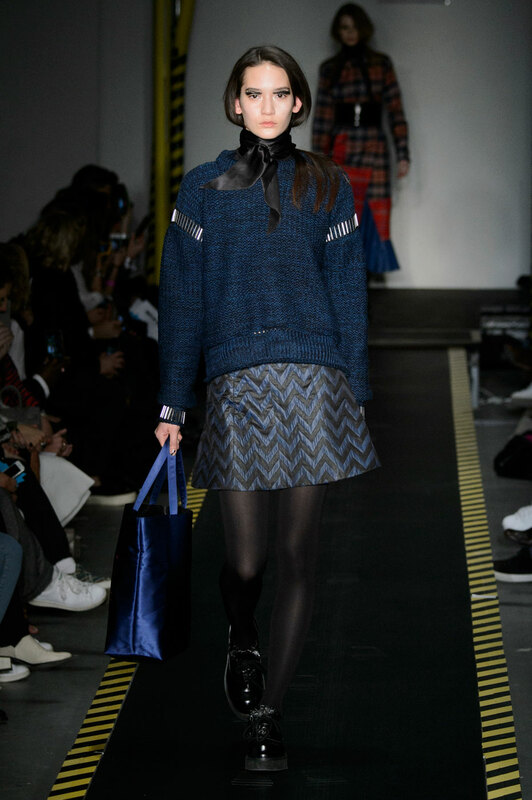 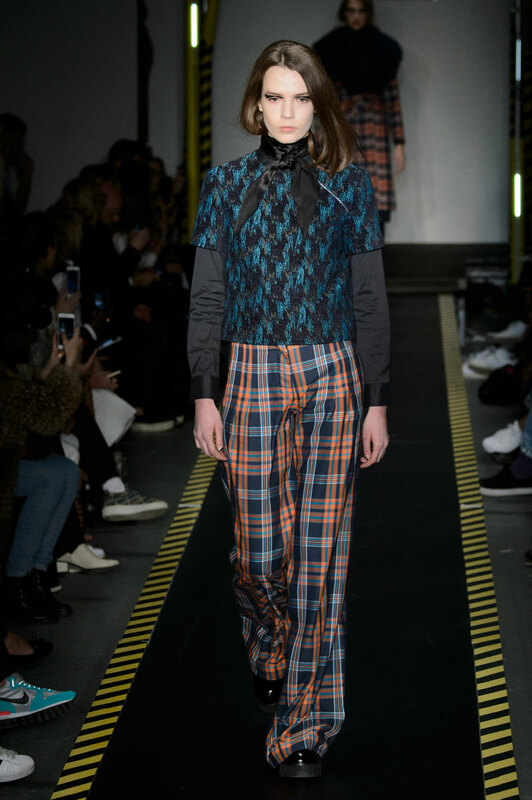 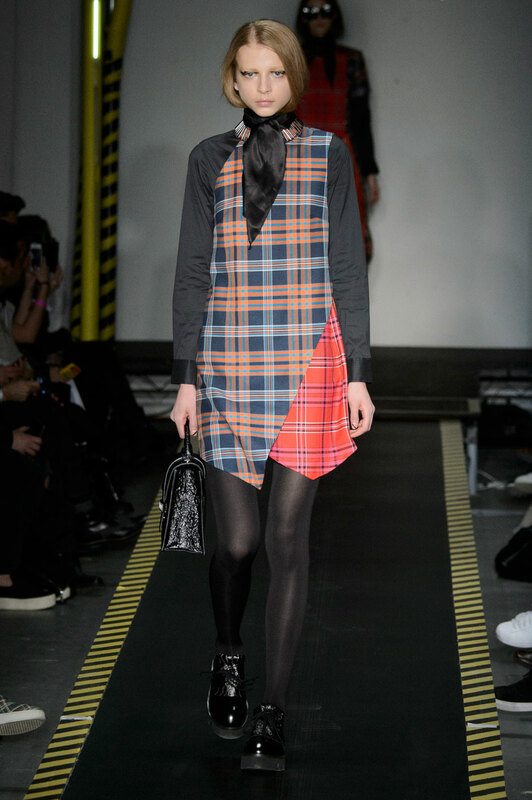 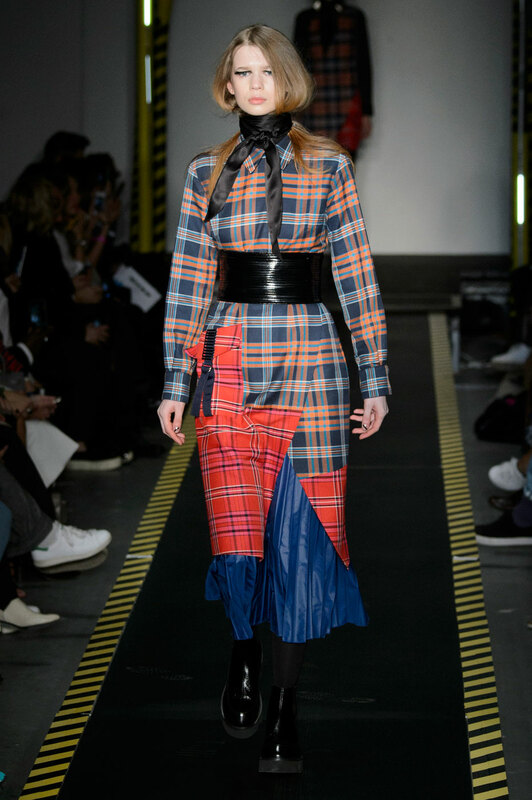 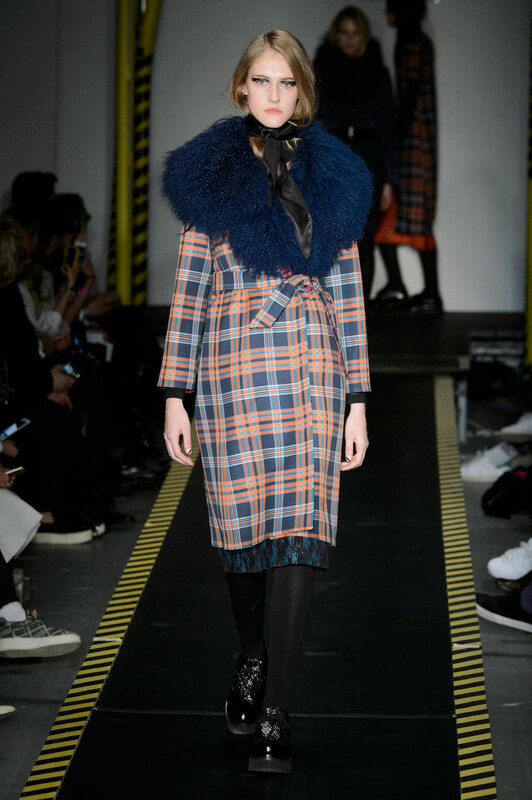 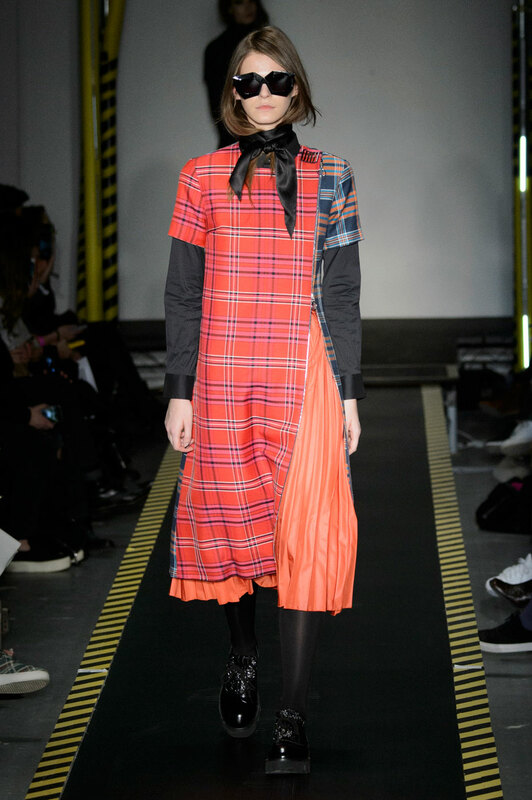 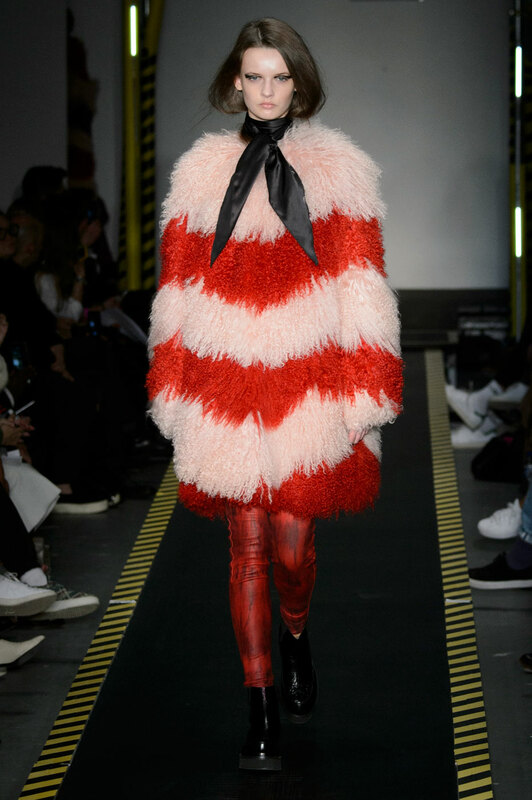 House of Holland Women Autumn-Winter 2015 - Tartans, stripes, furs and more, Henry Holland’s ‘Urban Urchins’ maintained the designer’s love of fun and flair in his mixed and matched AW collection. 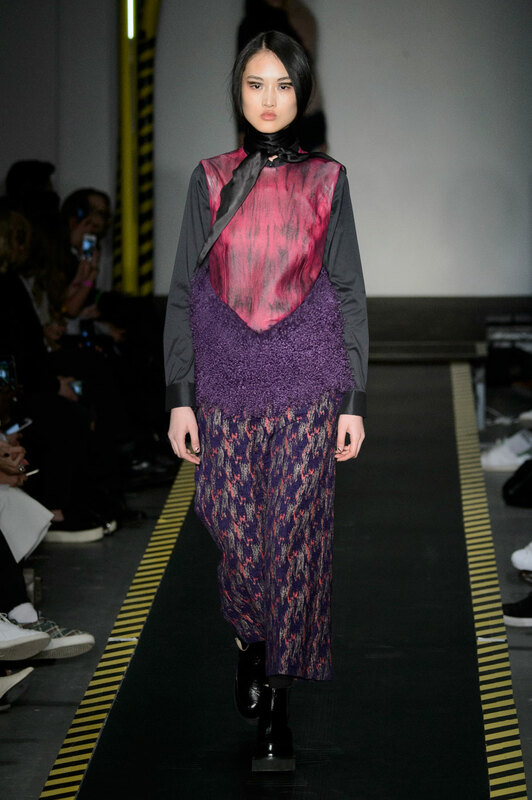 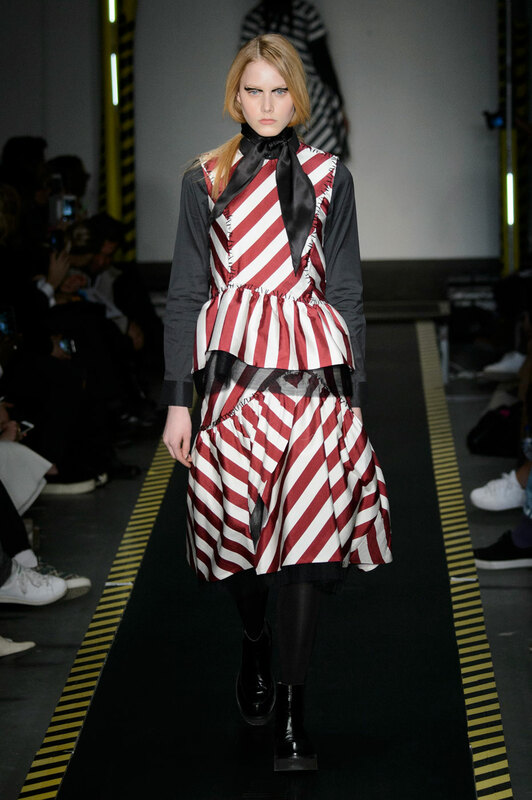 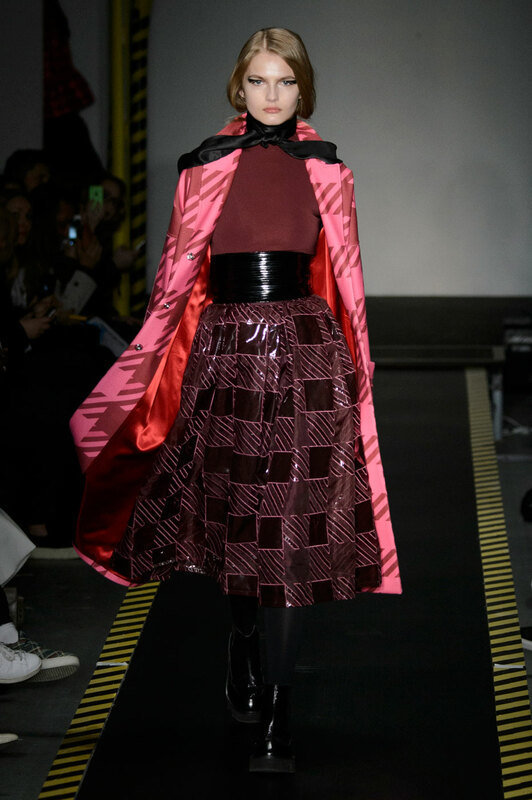 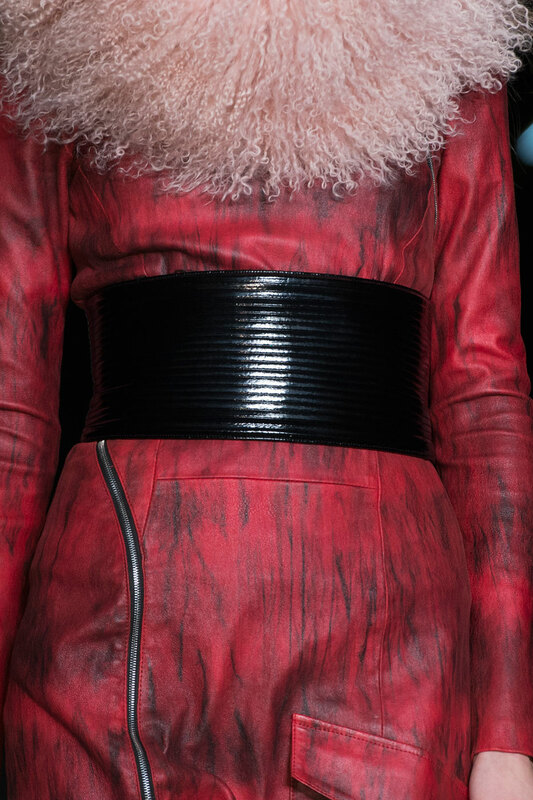 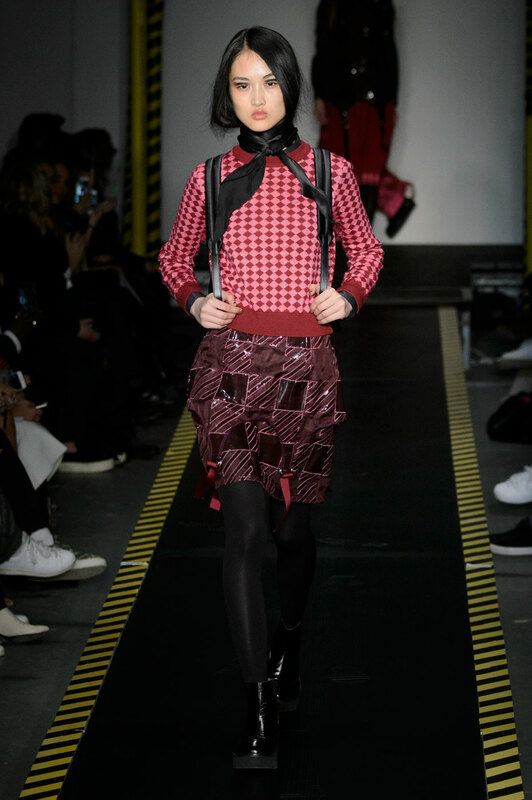 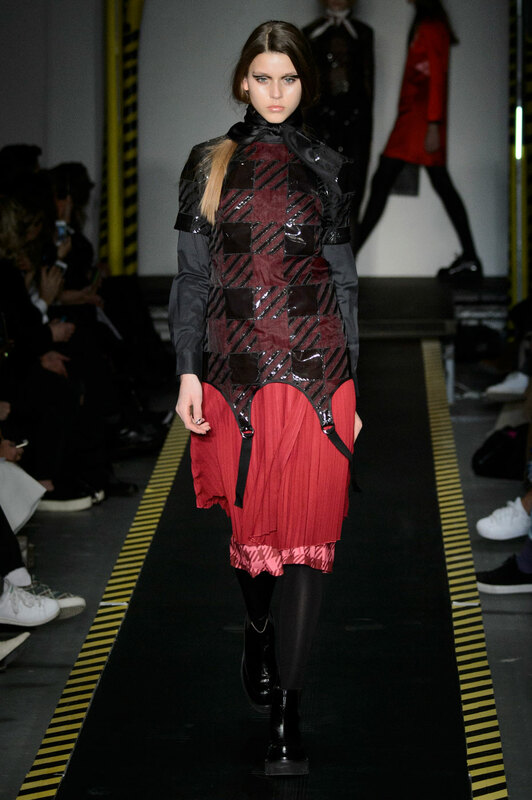 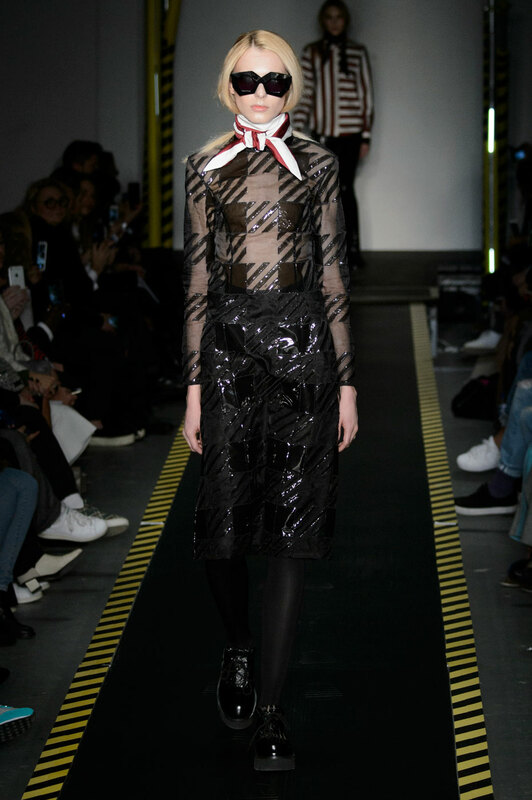 Inspired by his latest travels and love of Science Fiction films, Henry’s collection was a nod to favourites ‘Blade-Runner’ and ‘Fifth Element’ with the designer transforming his catwalk into a modern day travelator to the joy of the crowd. 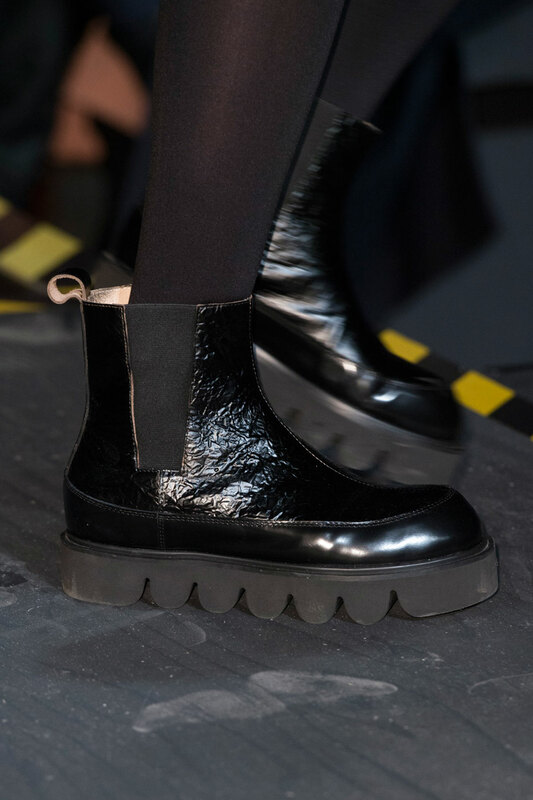 As models motionlessly glided along the hazard-lined conveyor belt – with their empty eyed stares evoking a sense of model manufacturing – designs soon began to mirror the set with neon brights, warning-striped shirts, and Doc Marten worker style boots taking centre stage. 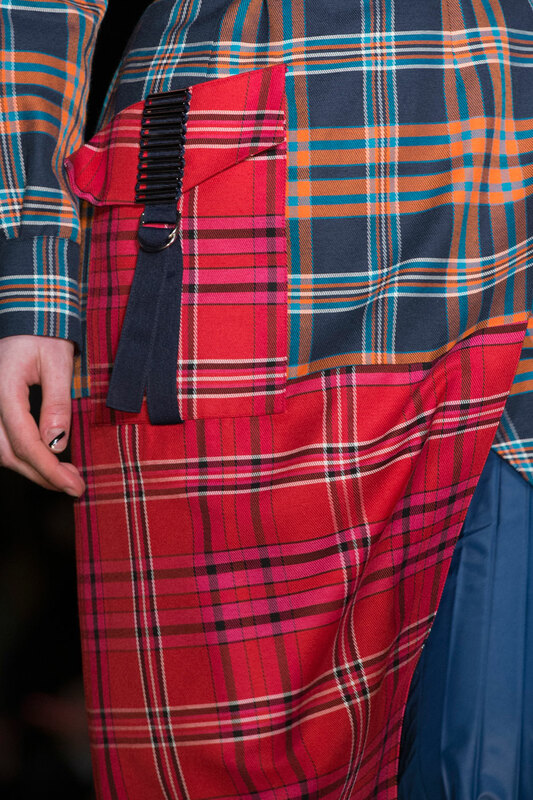 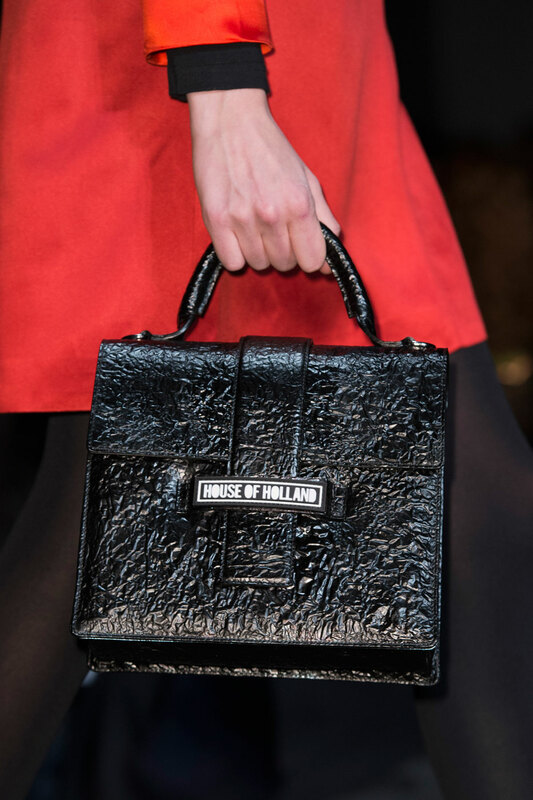 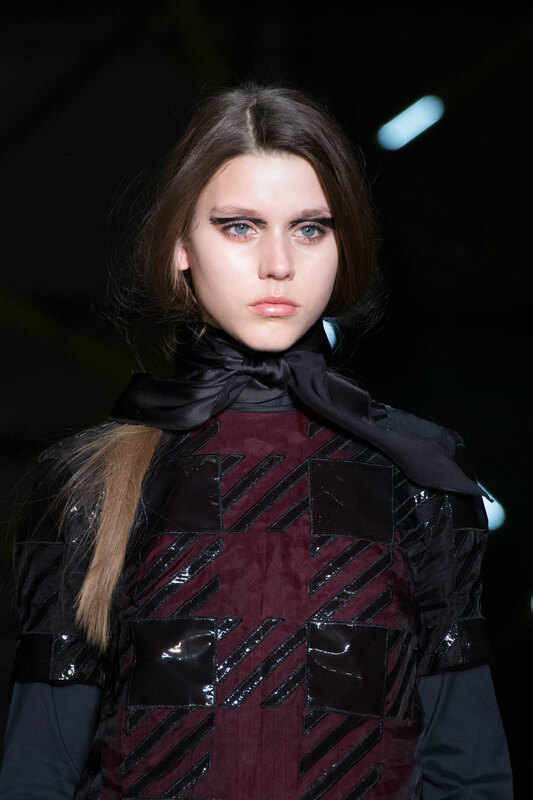 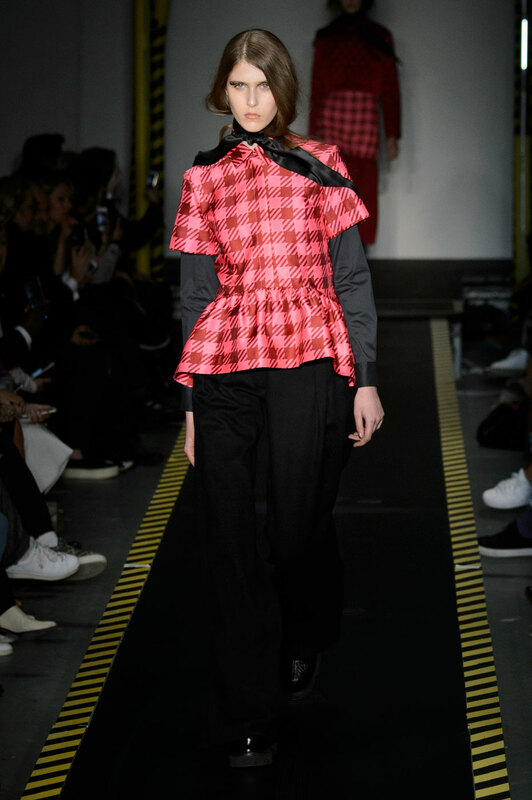 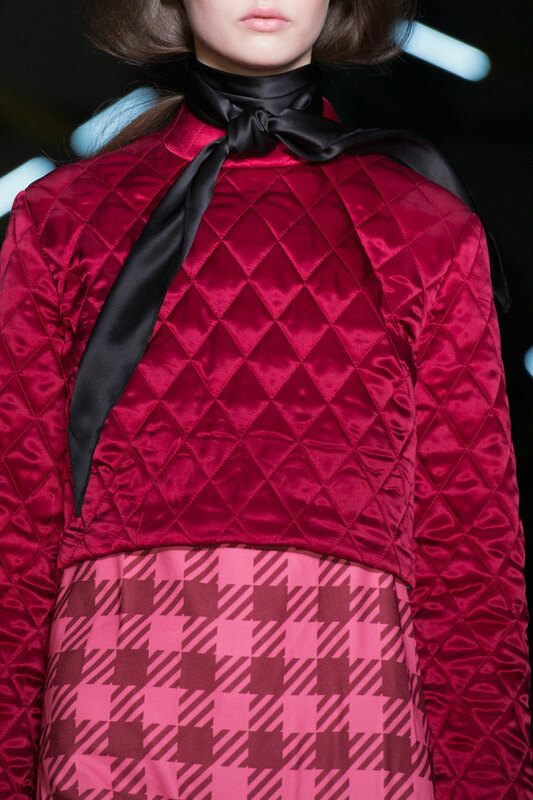 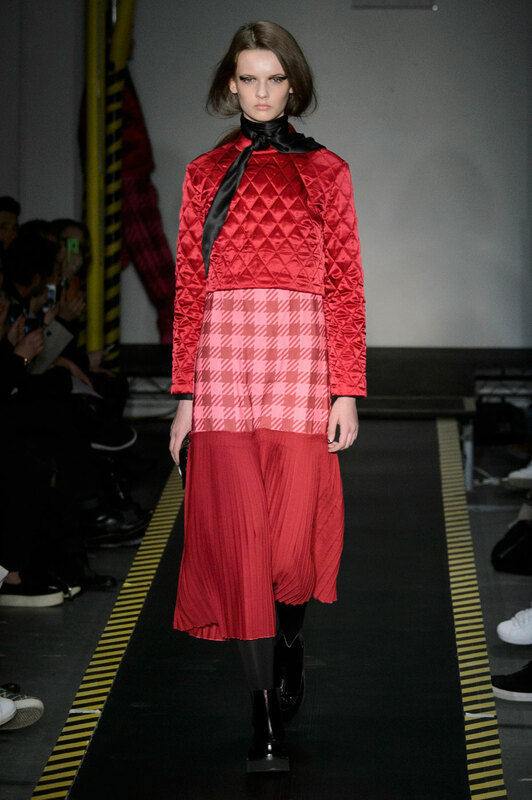 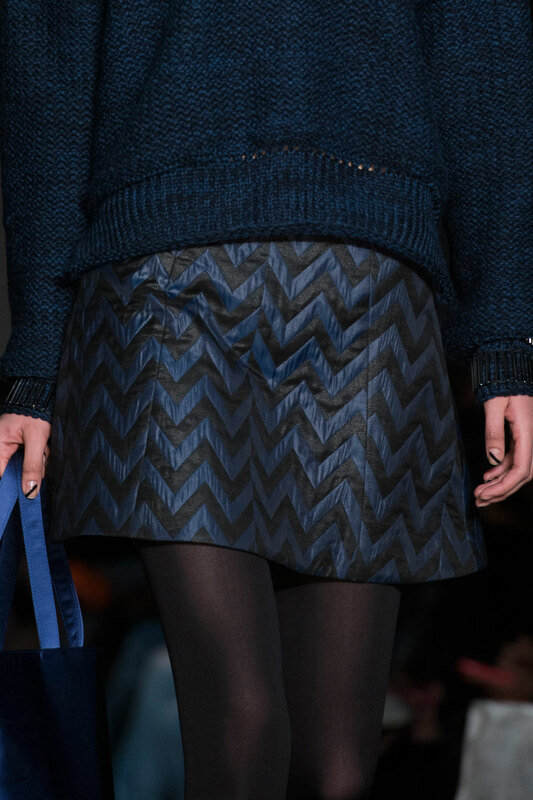 Whilst a stream of looks preserved the House of Holland signatures of multicoloured tartans and mixed pattern pieces, the collection included many other interesting pieces including quilted sweatshirts, high-waisted zipped leather skirts, and flares in pink- hued plaid. 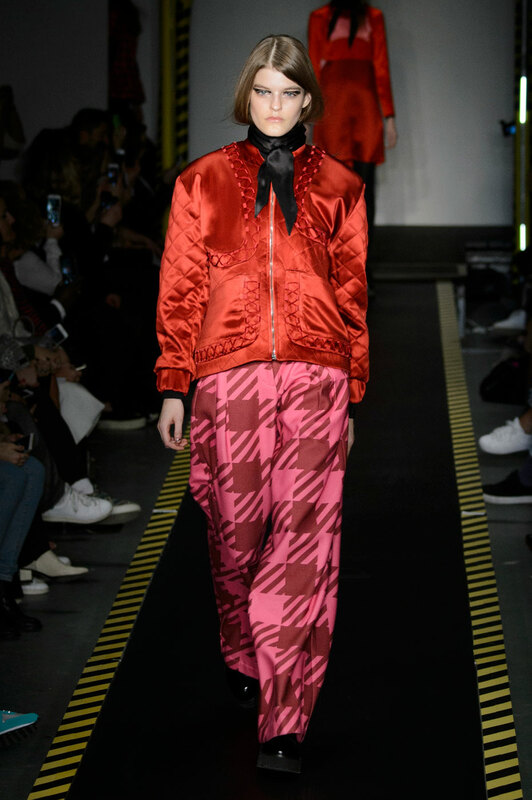 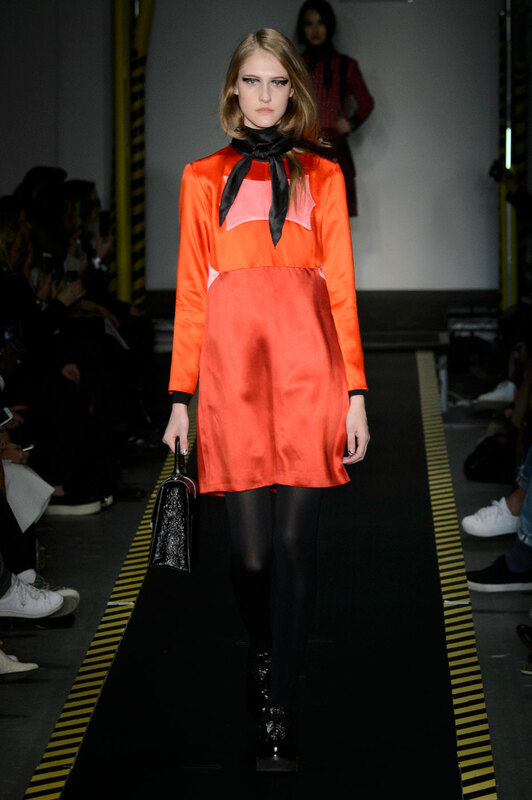 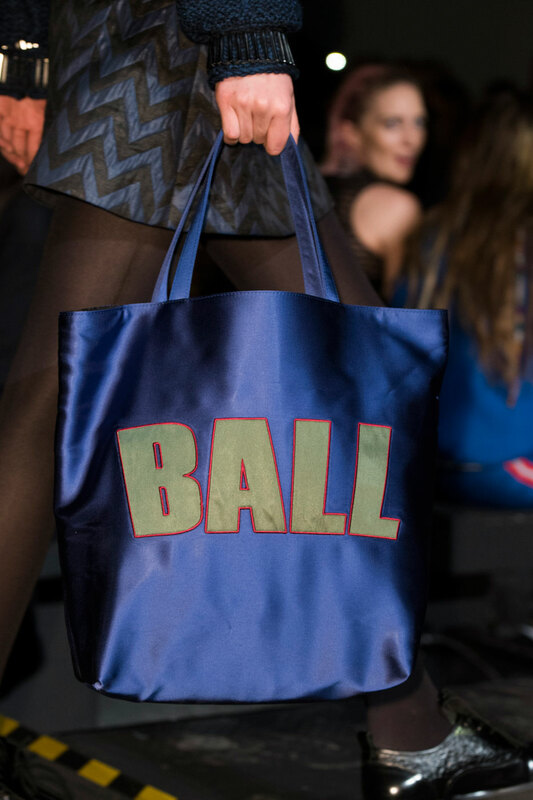 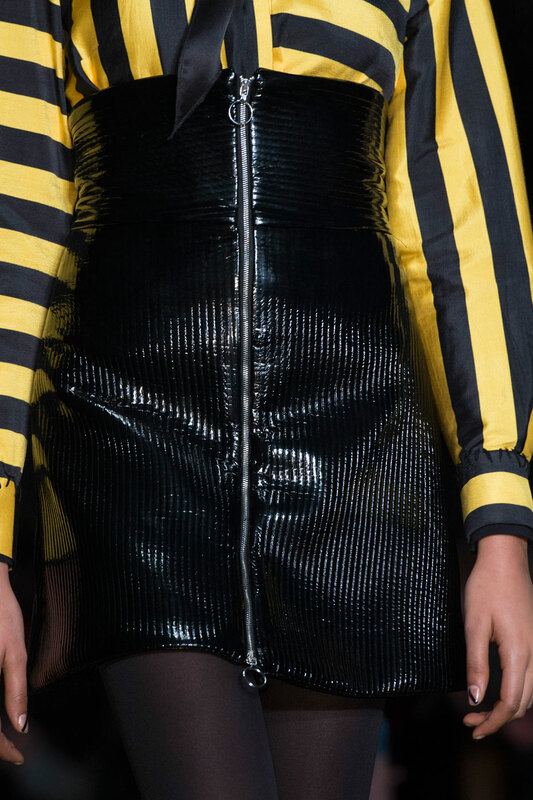 With more simplistic items comprising of brightly coloured bomber jackets and sleek satin mini-dresses, the designer utilised sheepskin to create the real show-stopping pieces. 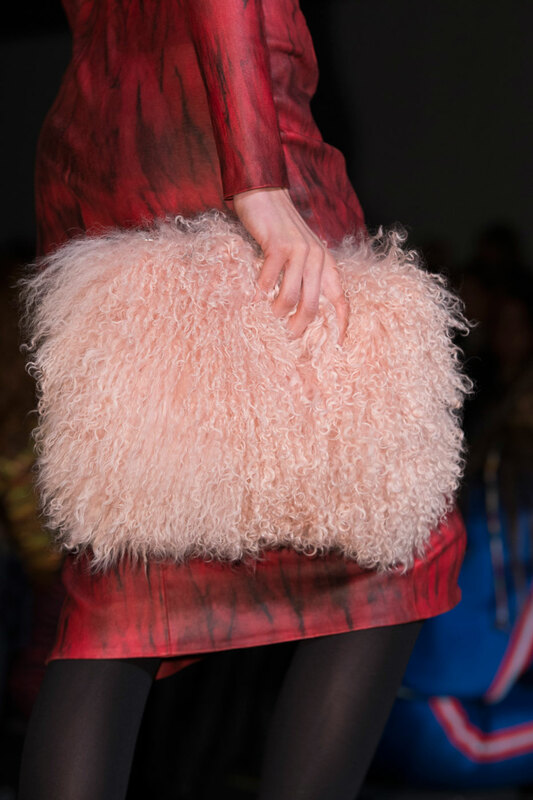 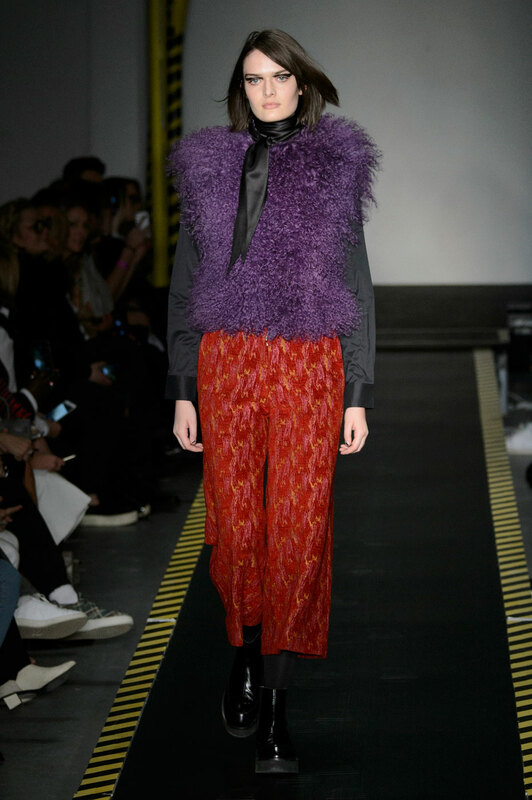 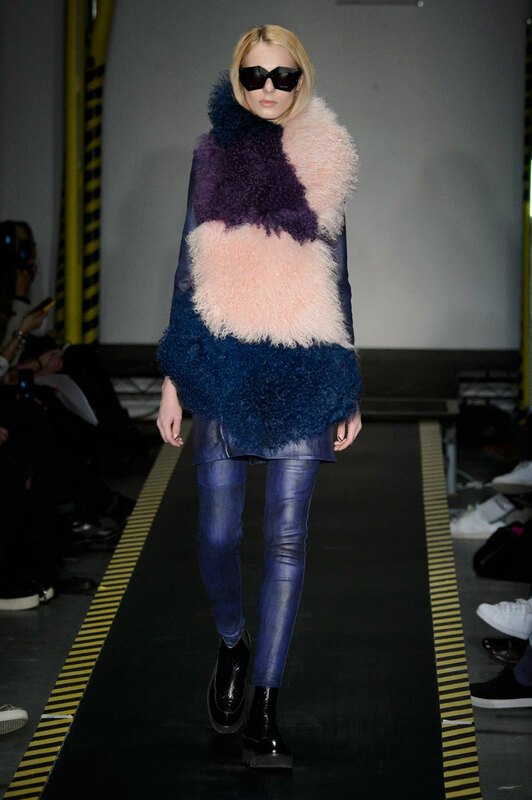 Using the texture to create tri-coloured Mongolian fur vests, oversized fluffy snoods and a series of clutch bags, this collection is one bound to leave you feeling warm, fuzzy and downright funky.